Elrod House in the original state, before recent design changes. Floorplan of Elrod House, with filming locations: James Bond enters via large door, and then the glass doors in to the house; he then sees Thumper on the red B&B Italia chair and Bambi laying on the rock. After the swimming pool fight, Bond and Felix Leiter walk down the stairs to find Mr Whyte. In the living room we can spot three magazines on a glass table: Time Magazine (May 17, 1971), Fortune Magazine (April 1971) and Venture Magazine (May 1971). James Bond (Sean Connery) visits the house to find Mr Whyte. He walks up the driveway, enters the premises through a large door and enters the house through a glass door. In the main living room agent 007 is welcomed by Bambi (Lola Larson), who sits in a B&B Italia Serie Up 2000 armchair. After a fight between Bond and Thumper (Trina Parks) and Bambi, Bond is thrown into the pool, and there he finally wins the fight. Felix Leiter and his men come rushing in and they all walk down via the concrete stairs next to the pool, down to a locked room where they find Mr Whyte. Elrod House was designed in 1969 by legendary architect John Lautner for interior designer Arthur Elrod, hence the name 'Elrod House'. The luxury house boasts almost 9,000sq ft (830m2) of living space and five bedrooms and is built on a rocky hillside, about a mile away from downtown Palm Springs. The concrete poured single-story structure is defined by its circular living room with rosewood walls and black slate herringbone flooring. A concrete 'umbrella' dome overhead with clerestories radiating from the center floods the room with light, and a massive curved curtain wall retracts to reveal panoramic vistas of the Coachella Valley. Below the living room is the pool and deck, which feature prominently in the film. The remaining interiors, which include a long kitchen and two bedrooms, have a unique organic feel that reflects the home’s setting, incorporating actual rock formations that rise up from the floor. One of the rocks is clearly seen in the film, right when Bond enters, as Bambi is laying on the rock. Today, the outdoor spiral staircase (also seen in the film when Bond and Felix Leiter walk down it to find Mr Whyte) leads to a newly built separate guesthouse, which sits on a lower level and has two more bedrooms, two baths, and a gym. The address of the house is 2175 Southridge Drive, Palm Springs, CA 92264, although in the film the summer house is referred to as being "on the ridge, about ten miles out of town" (the town being Las Vegas). Some of architect John Lautner’s other homes also have appeared in movies. For example Sheats-Goldstein Residence he designed for art collector James Goldstein famously appeared in The Big Lebowski (1998) and Charlie's Angels: Full Throttle (2003). Lautners appeared in A Single Man (2009 directed by Tom Ford) and Jacobsen House in Twilight (1998). 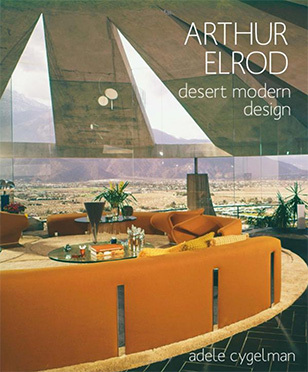 The Elrod House is featured in the 2019 book Arthur Elrod: Desert Modern Design by Adele Cygelman (224 pages, Gibbs Smith, February 2019, available on Amazon). Since the original design, the house has been slightly modified for modern use, including some interior changes, and a concrete side wall of the living room has been replaced by glass wall and glass sliding doors. Elrod House has changed owners a few times in the past decades. Billionaire investor Ron Burkle bought Elrod House in 1995 for $390,000. In 2003 it was sold for $5.5 million to real estate investor Michael Kilroy who wanted to make it into an ultra-exclusive invitation only private club, which was unsuccessful. Kilroy tried to sell the house in late 2009 for $13.9 million, but wasn't able to sell it. Event after lowering the price to $10.5 million in 2013 the house wasn't sold and ownership of the iconic residence was turned over to the property’s primary mortgage holder, Lloyds of London, who re-priced the property at $8 million. Elrod House was then sold in 2016 for $7,700,000 by Nelson-Moe Properties. Variety reported the buyer was fashion designer Jeremy Scott, creative director of the fashion house Moschino and the sole owner of his namesake label. In the movie the house is decorated in style with designer furniture: we can spot a B&B Italia Serie Up 2000 Armchair and an Artifort Ribbon Chair. Other items in the room include three magazines on a glass table: Time Magazine (May 17, 1971 edition), Fortune Magazine (April 1971 edition) and Venture Magazine (May 1971 edition).